Suzanne Morgan saw my article in Quilting Arts magazine and thought I'd love one of her 'everything kits.' She was right. This was made from her 'glow' kit, containing prefelt, roving, and gorgeous bits of dyed silks and yarn using the process I described in the magazine article. 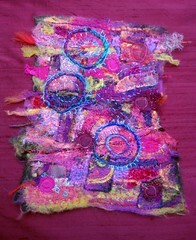 It'smade from the elements in her kit, with the addition of some of my sari silk ribbon, and embroidery thread. I've mounted it on a piece of burgandy dupioni silk. I've got her 'earth and sky' kit too, and I'm thinking of doing a tutorial here on my blog next week--what do you think? Oh, and I've still got photos of Venice to post! Stay tuned! Glad you are back!! Will love and appreciate a tutorial on the needle felting Rainbow Series, they are soo beautiful! This is wonderful - what colors! Yes would love to see a tutorial. After mouting it on the dupioni, how do you finish it off for presentation? I'd love a tutorial on the process! Thanks Jane! The piece is gorgeous! Gorgeous! A tutorial would be fun. Jane, What you've donw with Suzanne's kit is lovely. Glad you two connected (she's a friend and you are a Flickr contact). I loved the article but would love love a tutorial here!!!! YHour pieces are wonderfully spontaeous and so full of wonderful color and texture!!! Thank you so much for sharing all of the great [pictures of your trip to Italy! Attending a class like that would be such a dream!!!! Jane, I also have one of Suzanne's kits. The two of you are mighty talented artists. I would love to see you post a tutorial on your blog.